René Rast from Audi Sport Team Rosberg continues to make DTM history: In Saturday’s race of the season finale at the Hockenheimring, the Audi driver celebrated his fifth consecutive victory. No other driver has ever achieved this feat before in the touring car racing series that has been held since 1984. To keep the title race open up until the last event on Sunday, Rast had to finish in front of his two rivals on Saturday, Paul Di Resta and Gary Paffett (both Mercedes-Benz). On clinching third position on the grid, he already kept Di Resta at bay in qualifying. In the race, he defeated Paffett in a spectacular but fair duel that swept the spectators at the Motodrom from their seats. The two title rivals overtook each other on numerous occasions before Rast managed to decisively pull clear of the field at the Indy-style restart following a safety car period. 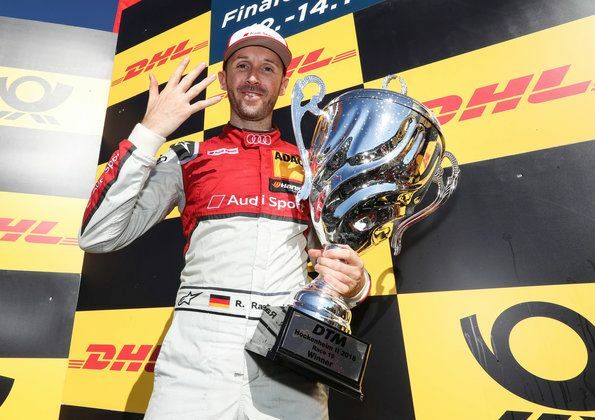 Following his fifth victory this season and ninth in total in his DTM career, Rast is trailing the new leader of the standings, Gary Paffett, by 15 and Paul Di Resta by nine points. A total of 28 points are yet to be awarded in the last race on Sunday (starting at 1 PM CEST live on SAT.1): three for pole position and 25 for victory. Decisive, above all, for the outcome of the race on Saturday in hot summer temperatures of nearly 30 degrees in the shade, was tire management. 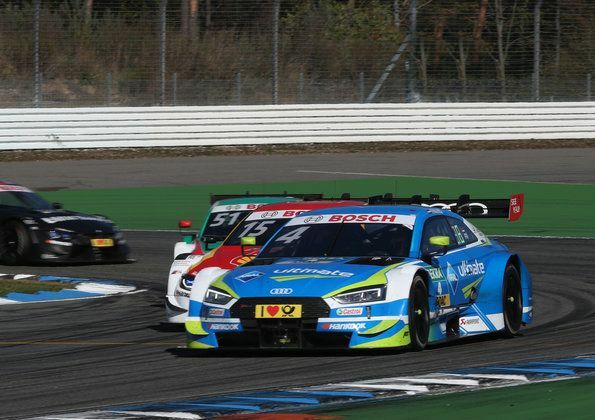 While Paffett as the best Mercedes-Benz-driver still dropped to fourth position in the final stage and missed the podium, Robin Frijns from Audi Sport Team Abt Sportsline advanced from tenth to second place during the final laps. As a result, he perfected Audi’s third one-two result in succession. The Dutchman had pitted late and had the freshest tires in the final stage of the race. Impressive as well was the performance delivered by Loïc Duval and Mike Rockenfeller (both Audi Sport Team Phoenix), who advanced from the eighth row on the grid to finish fifth and sixth. 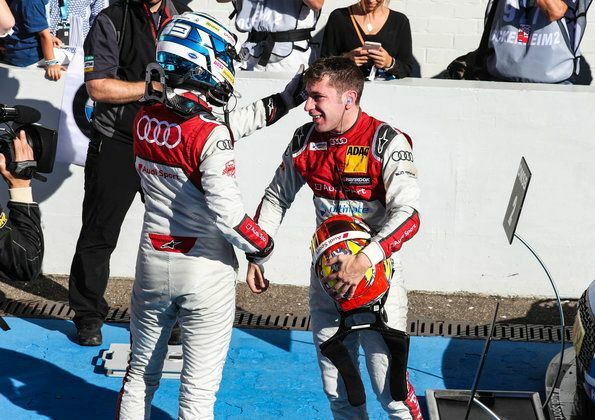 With Nico Müller in seventh position, a total of five Audi RS 5 DTM cars finished in the top seven. Only Jamie Green, in 13th, remained without points in Saturday’s race. That was truly an incredible race and once again a perfect advertisement for the DTM,” said Head of Audi Motorsport Dieter Gass. “René (Rast) was already in a good position after qualifying, but then lost one place to (Augusto) Farfus at the start. I already thought that this would turn out to be a hard day for us. But René managed to overtake him. Afterwards, you could tell that we’re obviously doing a pretty good job in terms of tire management. When the safety car was deployed, I thought that our advantage was gone. But in the end, the safety car even helped us because Robin (Frijns) had the fresher tires and was able to attack.